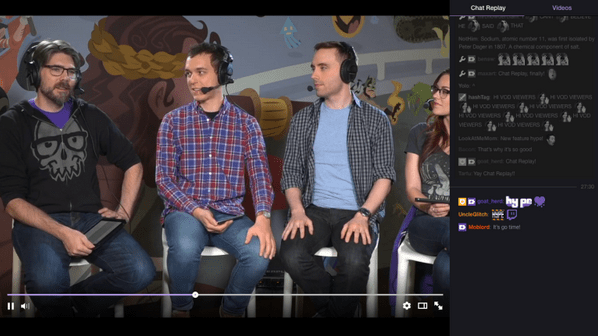 Twitch just rolled out at an awesome update to the VOD system, where the chat will be added to recorded videos. They are calling the feature Chat Replay and will have the same functionality as the browser extension ReChat. So, when you watch a recorded stream or highlight from your favourite streamer, the chat will appear next to the video, just like when watching live. However, you will not be able to type in chat, but you will be able to see what the streamer sees and the messages that they are responding to. You needn’t be concerned about chat moderation, any messages that are deleted in the live cast, will also be deleted in Chat Replay. Furthermore, any channel moderators will be able to delete any messages that were missed during the live cast. Unfortunately any old VODs will not have the Chat Replay feature, but any moving forward will have the chat captured starting today! For further questions, check out the Chat Replay FAQ.